The 2020-model-year new Cascadia introduced today delivers SAE Level 2 driving capabilities with the optional Detroit Assurance 5.0 suite of camera- and radar-based safety systems. This new, proprietary system can accelerate, decelerate, and steer independently. 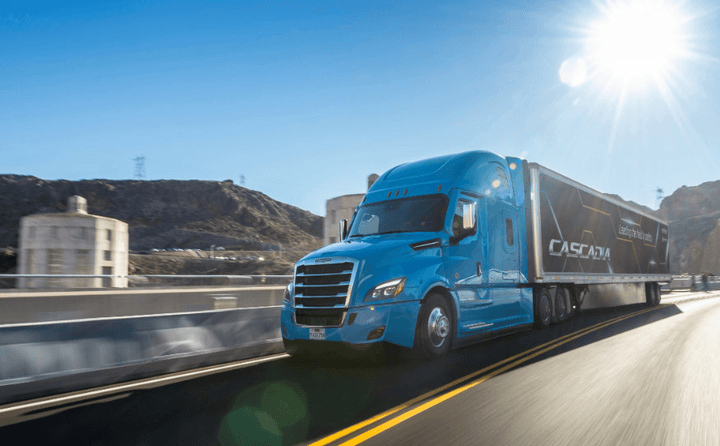 Daimler Trucks North America announced it’s now offering the first SAE Level 2 automated truck in series production in North America with the latest enhancements to the Freightliner new Cascadia for the 2020 model year. Level 2 automation means the truck is capable of both lateral (steering) and longitudinal (acceleration/deceleration) control – but Daimler also wants to put Level 4 automated trucks on North American roads this year. The company made the announcement during the CES electronics show in Las Vegas Monday, Jan. 7, where parent company Daimler Trucks also announced additional investment in automation – and that it’s reassessing truck platooning after testing “currently shows no business case” for the technology on new aerodynamic trucks. Automating acceleration, deceleration, and steering reduces the chance for human error, mitigates collisions, and can potentially save lives, DTNA said. These technologies can also enhance the driver experience by making the truck-driving task easier. 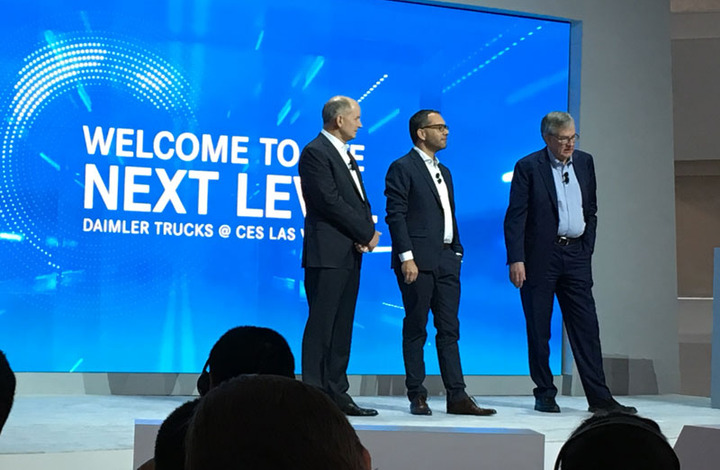 The move is backed by parent company Daimler Trucks, which announced at CES an investment of over half a billion dollars and more than 200 new jobs in its global push to put highly automated trucks (SAE Level 4) on the road within a decade. Most of these jobs will be located at the new Daimler Trucks Automated Truck Research & Development Center at DTNA’s headquarters in Portland, Oregon. In 2015, DTNA showed off its automated driving technology with the Freightliner Inspiration Truck, a concept truck that was the first automated truck licensed to operate on U.S. public highways. Adaptive Cruise Control to 0 mph: Improves safety, efficiency, and driver comfort by automatically decelerating and accelerating to maintain a safe following distance. This technology is especially important for maintaining a comfortable driving experience in congested traffic conditions, where repeated braking, accelerating and resetting of traditional cruise control can lead to driver fatigue. Active Brake Assist 5.0: The fusion of Detroit Assurance 5.0 camera and radar technology detects moving pedestrians and cyclists in front of the truck and can deploy full braking, which Daimler says is an industry first. It can also detect and mitigate a collision with full braking on moving and stationary vehicles and objects. Side Guard Assist: Detects objects, including pedestrians and cyclists, in the passenger-side blind spot for the tractor and a full-length 53-foot trailer (another industry first, according to the company) and delivers an audible and visual warning. The new Cascadia also features one of the industry’s most efficient designs, according to DTNA, with a 35% improvement in fuel efficiency compared to the first Cascadia introduced in 2007. Aerodynamic enhancements to the new Cascadia include Aerodynamic Height Control. This electronically lowers the suspension height at 55 mph to optimize airflow over and under the front of the truck and reduce drag. In addition, the truck features Michelin X Line D+ Energy tires, developed in collaboration with Michelin, which reduce rolling resistance in 6×4 applications, and a low ground clearance bumper. Another critical component of the new Cascadia’s performance is its Integrated Detroit Powertrain, a combination of a proprietary heavy-duty engine, transmission, and axle designed work together for maximum efficiency. The integrated powertrain features Intelligent Powertrain Management 6, which uses the truck’s kinetic energy to automatically adjust to the truck’s surroundings by reducing braking power and making transmission and engine adjustments, saving fuel and reducing wear and tear on components. The next step, Daimler said, is jumping from Level 2 to Level 4, and in fact Martin Daum, Daimler Truck & Bus chief, told the press at CES that Daimler wantsto put Level 4 automated trucks on North American roads this year. In commercial trucking, level 4 is the natural next step after level 2, so the company is skipping the intermediate step of conditionally automated driving (level 3). Level 3 automated driving does not offer truck customers a substantial advantage compared to the current situation, as there are no corresponding benefits to compensate for the technology costs, contends the company. Daimler Trucks also officially announced that it is reassessing its view on platooning. Daimler Trucks defines platooning as the electronic coupling of two or more trucks with significantly reduced distance between them to, in theory, improve aerodynamics and therefore save fuel. Daimler Trucks has tested platooning for several years, especially in the U.S., where benefits would be expected to be the most substantial. 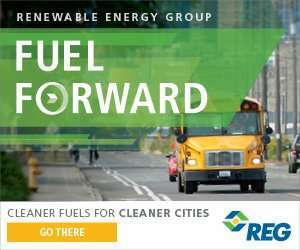 However, the company says the testing has shown that fuel savings, even in perfect platooning conditions, are less than expected, and those savings are further diminished when the platoon gets disconnected and the trucks must accelerate to reconnect. “At least for U.S. long-distance applications, analysis currently shows no business case for customers driving platoons with new, highly aerodynamic trucks. Daimler Trucks will, of course, remain committed to all partner projects that are still ongoing,” it said.